36" AND 42" SNOW THROWERS . . . you ride through winter powering away the meanest drifts and wettest snow. Adjustable skid shoes put the auger and blade right down on hard surfaces, or let you skim over gravel driveways. Belt-driven auger no shear pins. Throws every bite up and over banks and build-ups. 42" GARDEN CULTIVATOR . . . V tool bar mounts five six inch sweeps and two six-inch half sweeps shovels along with two gauge wheels. Works 6" to 42" rows . 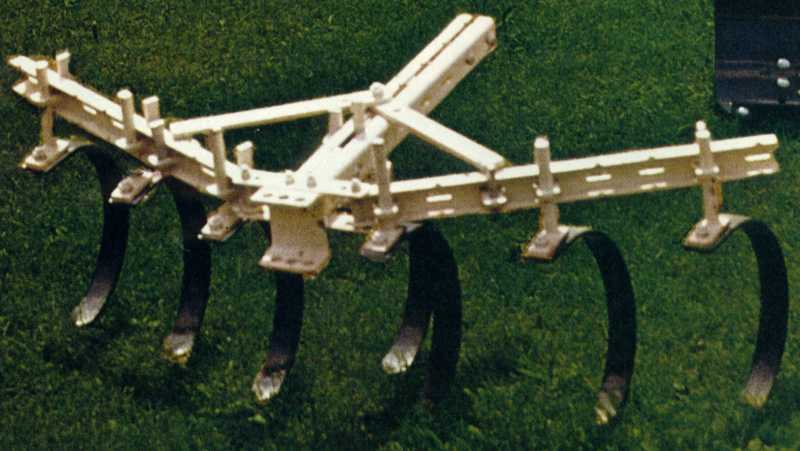 . . adjusts to plow both sides of a single row and half the middle; or the full middle and each side of two rows. Vertical adjustment on standards is accomplished through special wedge lock inserts. 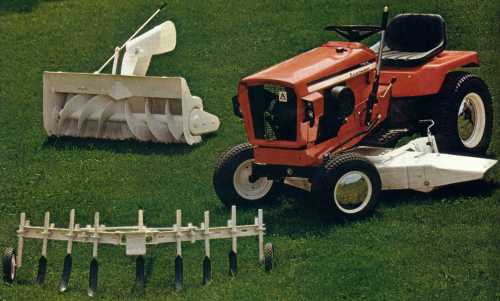 42-INCH ROTARY MOWER . 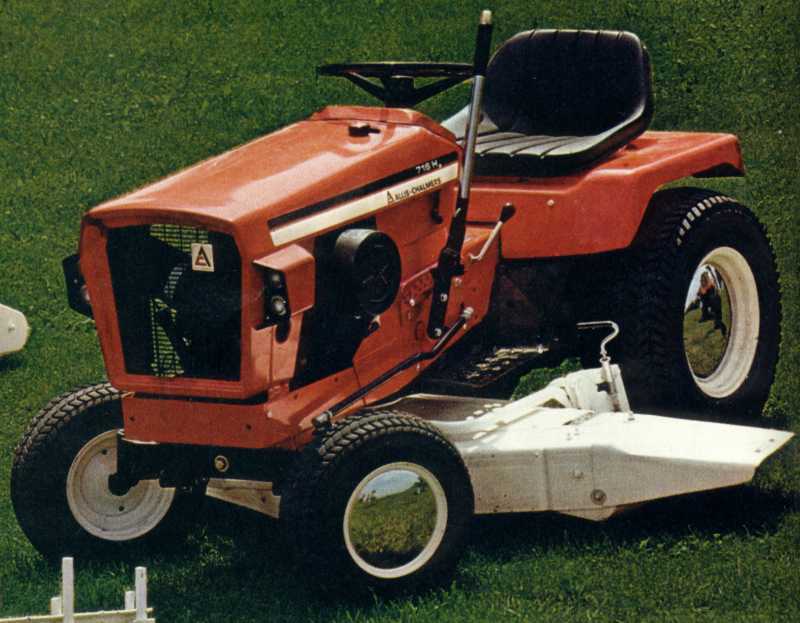 . . sized for most lawn areas and any 700-Series tractor's Power and speed. Three overlapping blades for full-width effectiveness. Deep deck generates more air volume to mix with clippings for broader dispersion. Front axle hook-up, full width rollers and short tractor wheelbase practically eliminate crown scalping and contour shaving. 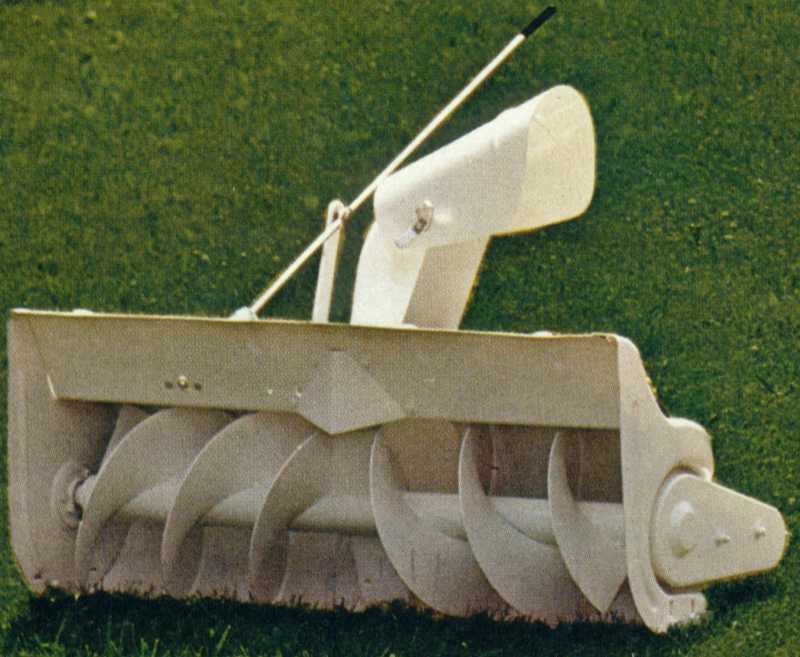 10" MOLDBOARD PLOW . . . turns over soil and sod, covers weeds, crop trash, field residue. Leaves the surface lumpy to slow down water run-off and wind erosion. Adjustable draft control. Rolling coulter slices through ground cover for clean cut furrows. 42" SPRING TOOTH HARROW . . . prepares rough seedbed, digs deep to penetrate hard soil conditions pulling out weed and grass root growth to leave soil loose, open and clean. Seven coil spring teeth, individually adjusted through wedge lock inserts. SNOW PLOW AND DOZER BLADE . . . powers through snow condition wherever you have room to push winter around. 42-inch blade angles from the tractor seat . . . up to 30 degrees left or right . . . Blade also tilts with front axle to hold level cut on slopes and inclines. Adjustable skid shoes and float position let you clean hard surfaces clear . . . skim right over gravel drives. Great for light backfilling and trench covering.